Sometimes something can worry you for years, and you don’t quite know what to do about it. Robert Fisk’s writing is one of those things for me. His stories are compellingly fluent, fabulously channel Middle Eastern victimhood, and satisfyingly cast grit in the eye of Western governments’ hypocrisy. And yet against this I always have to set my experience that, in one case that is personally important to me, the swirl of rumours about Fisk’s cavalier treatment of facts seems to be true. My particular assertion about Robert Fisk’s journalism comes in a chapter of Dining with al-Qaeda devoted to the question of accuracy in Middle Eastern reporting (pages 20-27). 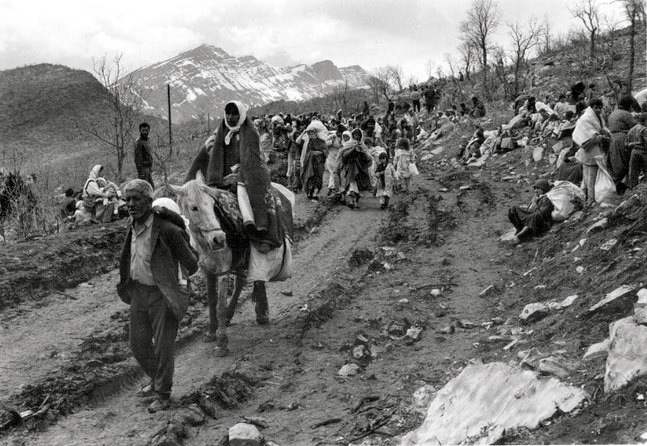 It relates to an episode during the 1991 Iraqi Kurd refugee crisis on the mountains of the Turkish-Iraqi border. A piece by Fisk said that Turkish troops were on a “rampage of looting” stealing Iraqi Kurd refugees’ “blankets, sheets and food”. This, according to him, had led to a near-armed clash between Turkish and British troops. Fisk’s report gravely set back Turkish-allied cooperation in the relief effort. 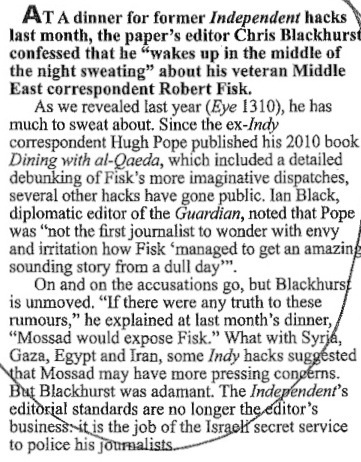 Fisk was expelled and I was ordered out too, since I worked for the same newspaper, Britain’s Independent. I was later reprieved, partly because I had nothing to do with the story. I had been back in Istanbul, writing up my own experiences of the refugee camps. While putting together Dining with al-Qaeda, I telephoned Fisk’s main named source in those mountains, a British military doctor. To make sure, I also contacted a senior British diplomat in charge in those days, now in retirement. Both flatly denied there was anything near a clash and thought the charges of theft and tensions were sensationalized. Moreover, I noted inconsistencies between Fisk’s accounts in the newspaper and in his memoir (The Great War for Civilization, 2005). For instance, in a major narrative section of his book that is absent from the original article, Fisk meticulously describes a flight to the refugee camp in the crew bay of an Apache helicopter. The trouble is, Apaches have no crew bay. 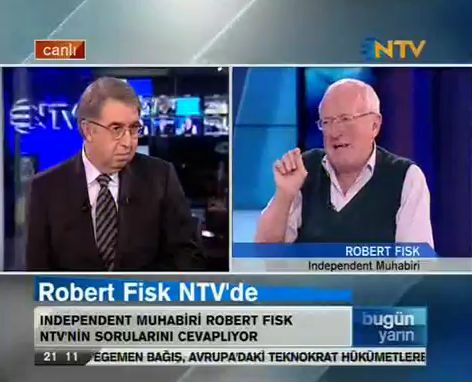 So it was that, when watching Fisk interviewed at length on Turkish NTV on 17 November 2011 (here), I averted my eyes towards the end when I heard journalist Barçin Yınanç pose a question that focused on my name. She said that “even though [Hugh Pope] praises your journalism”, I had written in a book that his report on that long-ago incident was exaggerated and “not based on data”. Look, I don’t read Hugh Pope. Sorry. In the incident in question, I was in an aircraft, helicopter, full of CIA men, who had to go and intervene to prevent British and Turkish troops fighting each other. They were either side of a small stream with their rifles pointed at each other in front of my eyes. This wasn’t data. I was an eyewitness. The Americans had to go into the stream and stop them shooting at each other, because the British were trying to stop this small group of Turkish soldiers taking blankets and food from refugees … Hugh Pope’s got it wrong, as with other things during the past. I don’t have any feelings about Hugh Pope. I was an eyewitness to what happened. Sorry. I was there. He was not. I was however only half-listening to the rest of the interview. Fisk had vowed three times that he had been “there”, an “eyewitness” to that 1991 incident, as he tells the story in his memoir. But he hadn’t explained why his original story (“Troops steal food and blankets from refugees”, Independent, Tuesday 30 April 1991) firmly sets the reported confrontation over the stream on Sunday night the 28th of April, while stating that he had arrived “yesterday”, which in the Independent‘s style means Monday the 29th, that is, one day after whatever happened was over. Furthermore, Fisk’s original story cites soldiers talking of past incidents, but makes no claim of seeing anything of a confrontation himself. 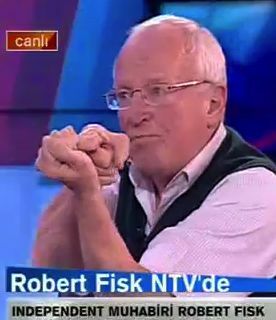 Whatever the British-Turkish tensions in the camp, Fisk has not convinced me that people are wrong to say that he over-played the situation. A question about his factual veracity about the incident has at last been put to him in public. I feel a sense of inner peace. The frustration that has nagged at me for 20 years has gone away. MEMBERS of the Vulture Club, a closed Facebook group for foreign correspondents and aid workers, are circling the carcass of Robert Fisk, the Independent’s man in the Middle East, for his holier-than-thou rant against fellow war reporters following the Syrian Army’s murder of Marie Colvin and Remi Ochlik. As a matter of fact, western reporters did get round the Israeli army’s restrictions on journalists during its war with Hamas. Led by Bruno Stevens, a brave Belgian photographer, 30 found a way in over the Egyptian border. Fisk’s innuendo that foreign hacks were glory-hunters for exposing the deaths of Syrians, and hypocrites for ignoring the deaths of Palestinians, has put the war correspondents on the war path. On the Vulture Club’s web page, Lulu Garcia-Navarro, foreign correspondent for America’s National Public Radio, describes Fisk’s article as “unconscionable”. Catherine Philp, US correspondent for the Times, says Fisk “makes it up”. Dan Murphy of the Christian Science Monitor tells of Fisk writing a piece attacking the Baghdad press corps for being “hotel journalists” who dared not go onto the streets, while rarely leaving the safety of the hotel pool himself. It is not only on closed Facebook groups that Fisk is being pummelled. Hugh Pope, a former Independent colleague of Fisk’s, recently published a memoir of his three decades of reporting in the Middle East, Dining with al Qaeda. When they were both covering the Iraqi Kurd refugee crisis in 1991, he writes, Fisk reported that Turkish troops were on a “rampage of looting”, stealing refugees’ “blankets, sheets and food”, and that British forces “cocked their weapons in a confrontation with the Turkish troops”. When Pope’s book came out Ian Black, diplomatic editor of the Guardian, drily noted that he was “not the first journalist to wonder with envy and irritation how Fisk ‘managed to get an amazing sounding story from a dull day’”. Meanwhile the leading Egyptian blogger Issandr El Amrani noted that “if you hang around journalists with several decades of Middle East experience, particularly ones who were in Beirut in the 1980s, you keep hearing these stories again and again about Fisk”. Hugh Pope’s memoir on his reporting in the Middle East, Dining with al-Qaeda, is, as they say, a must-read. The former Wall Street Journal and UPI correspondent — he is now at the International Crisis Group — was rated highly by his peers. His pragmatic thinking and rejection of neat ideological ways of looking at things in the region enriched his journalism, which was trustworthy and informative, even for those like me who had stints covering the region. Why does Fish get away with it? It has been common knowledge for years among British and American reporters that Bob can just make things up or lift other’s work without attribution and embellish it. I recall him doing it to me on a story in Kuwait about the killings of Palestinians at the hands of Kuwaitis following the liberation of the emirate. I remember also the time Fisk filed a datelined Cairo story about a riot there when he was in fact at the time in Cyprus. In the case of Fisk, I think, there was also a genuine sadness that Bob did this, an embarrassment and one undeserving of a journalist who had done some great and brave reporting in the 1980s in Northern Ireland and in his early and dangerous years in Beirut. [Many comments by foreign correspondents upset by Fisk’s suggestion that news rooms were ignoring Gaza in favour of Homs] expand on a remark made in the Guardian by Ian Black, the paper’s diplomatic editor, who was reviewing the memoirs of Hugh Pope, a distinguished Middle East correspondent, which strongly criticise Fisk’s style of reporting … Black was choosing his words carefully (as am I) but read between the lines. What about Ian Black’s innuendo? “I’m very surprised that he wrote that. I’m amazed to see that he wrote that review [of Hugh Pope’s book]”. But it isn’t just Black: it’s foreign correspondents from various publications who have encountered Fisk over the years. How could he explain their criticisms? “Colleagues will malign you if you’re a moderately successful journalist,” said Fisk. I do read Hugh Pope… I had the privilege to work with Hugh Pope when he was starting out in journalism with United Press International in Beirut in the 1970s. And I lived in the same building where Bob Fisk lived and i believe still lives. As Hugh Pope mentions in the above note, one tries to avoid telling stories on one’s colleagues.. I used to run into Fisk in various places one goes to in a war zone; the demarcation line along Beirut’s Green Line on either the Muslim/Palestinian/leftist side or on the Christian side; in the squalid refugee camps that ringed Beirut or yet in some of the villages and towns of South Lebanon, frequent targets of Israel’s retaliation raids. A day or two later I would read Fisk’s reports of events I and other colleagues had been to. And more often than not Robert Fisk’s description of these events were very different from what either myself or my colleagues had witnessed. Eventually i stopped reading Robert Fisk. 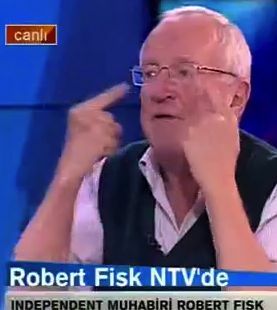 In his interview on Turkish TV Bob Fisk stated that he does not read Hugh Pope. Maybe Mr. Fisk’s reporting might have been somewhat more in line with what unbiased journalism should be had be bothered to read Hugh Pope. Claude Salhani is the author of three books: Black September to Desert Storm; While the Arab World Slept; the impact of the Bush years on the Middle East, and Islam Without a Veil. I read Hugh Pope too. I’ve also had the privilege of working closely with him over the years and his character and veracity are beyond reproach. Any question of his word against Mr. Fisk’s – or anyone else, for that matter – is no contest. When the reporter gets more attention than the story, it’s time to move him on. Send him back to ambulance chasing, his true metier. 1. That Fisk claimed to be in a cargo bay of an Apache. Mixing Apache and Blackhawk does not fundamentally disprove what he reported. Do you have a reference for this in his book, because I do not recall reading that and expect I would have picked up on it? 2. You claim he was not at the event because of the dates – is that not explained by him starting the report on the 29th April ’91 (hence “arrived yesterday”) and finishing and filing the report the following day? Have you checked this with him? Surely he has a right to explain that? 3. You challenge his claim that the two sources you called denied there was anything near a clash. Were they there when the event happened? It’s not clear from your assertions whether you have actually spoken to anyone who had any actual knowledge of the event. Were they there? Did they witness what happened at the camp on that day? Why, if nothing happened, did the marines get expelled for levelling a gun and roughing up Turkish officials? Doesn’t that corroborate Fisk’s story? 4. You claim there are inconsistencies between the account in his book and the account in the article. Aside from getting the helo model name wrong, what are they? And finally, you did not mention the Turkish interrogation and threats made against Fisk after he reported this event. Is that what innocent parties do? I came across this piece by chance, but as an uninvolved observer your piece to me appears to lack anything conclusive. I would be interested to hear your response to the points I have raised. 1. The Apache episode is on pp 667-676 of Robert Fisk’s ‘The Great War for Civilization’. 2. At the Independent, as I mention in the blog, we wrote “yesterday” about the day we were writing our story, so that the next day the reader of the published article would be clear about which day (“yesterday”) was being referred to. (This differs from some American practice with dated datelines). And as I mention, Robert Fisk’s Independent report from the scene makes no claim to have seen this confrontation. Fisk’s versions of this incident can be found in a) his reporting at the time b) his book ‘The Great War for Civilization’ and c) his comments on Turkish television, as mentioned in the blog. For the purposes of a blog, I think his position is clear enough in his recorded statements and his statement to the Telegraph columnist. 2. My interviews with those with knowledge of the event can be found in my book Dining with al-Qaeda, pp 20-27. One was a direct witness, quoted by Fisk at the time, a doctor who says Fisk’s report was exaggerated, that he knew of no major confrontation, and that he was misquoted. I think many of your other questions will also be answered if you read the full text. 3. The alleged incident of British troops roughing up a Turkish official referred to in the L.A. Times report is separate to the one referred to by Fisk (the newspaper says the Turkish official who supposedly suffered ill-treatment had gone to investigate whether Fisk’s report was true!). Thanks Hugh, I appreciate you taking the time to respond. 1. You’re right – he refers to an Apache, however if you look on the preceding page you will see he refers to being in a Blackhawk. Isn’t this just a mistake in the helicopter nomenclature? 2. I will get a copy of your book and have a look. It sounds very interesting. Did you ask those you interviewed whether they had been censured for speaking to journalists about this incident before? It didn’t sound like the British were very happy about this incident being known about considering the friction it caused. Would it not be quite sensible for Davis to be wary about inflaming things again? “American Special Forces troops who have been running aid programs in the refugee camps for the last two weeks have been stunned both by the hostility that Turkish troops have shown the refugees and by repeated incidents in which Turkish soldiers have stolen food, blankets and other relief supplies, and in some cases sold them back to the refugees at exorbitant prices. a) There were US special forces present in the camp as Fisk described? Of course, they have been known to travel in UH-60s from time to time. b) The behaviour of the Turkish troops was as he described? So as described here, there was indeed a face-off between the Turks and the Royal Marines, and then subsequently there was an incident with Governor Erdogan. This backs up what you said about the separate incident, but doesn’t it also back up Fisk’s version of events, and provide an attributed quote to Sgt. Durant? Any news about the points I made in my previous post? I would be interested to know your answers. I have ordered your book and it is currently en-route from the US.